I received my D-Link DSM-330 HD Media Player review unit this week and am prepping for a review I hope to have up next week. This nifty little box is the first Divx Connected device for North America and it looks pretty interesting. It’s small and silent. It can be connected via Ethernet or wireless (802.11g). And handles HD video up to 720p across those wireless networks via HDMI. Best of all it’s running on an open platform so there are 3rd party plugins and customizations that can make this thing even better – some are already available. Features are very similar to your typical HTPC (Movies, Music, Photos, Online Content) minus the TV functionality. I’d put the DSM-330 right in the Apple TV market without the need for iTunes. The DSM-330 can be pre-ordered from Amazon for $250 if you can’t wait for the review. I’ll have a complete review with my experiences with this new box up on the Geek Tonic blog next week. Subscribe to this blog to make sure you don’t miss any updates. Dave at ZatzNotFunny has a review unit as well and posted a more detailed first look/unboxing post on the DSM-330 today and will be doing a review shortly as well so if you don’t already, put ZNF on your favorites list! The HD-PVR video quality is excellent. I was a little worried about how much picture quality loss I’d get since the device is essentially taking a once digital signal that is converted to analog and encoded in H.264 and pushed right to your HTPC. I can say that after testing 1080i and all the other formats I can get out of my Time Warner cable box and comparing it to OTA HD shows and unencrypted QAM shows from my HDHR, the picture is very, very good. I’m unable to tell the difference between an HDHR recorded show versus a HD-PVR show. I’ve had error-free recording and live tv viewing from the HD-PVR since day one. Not a single lockup, hiccup or problem even with heavy use and testing. 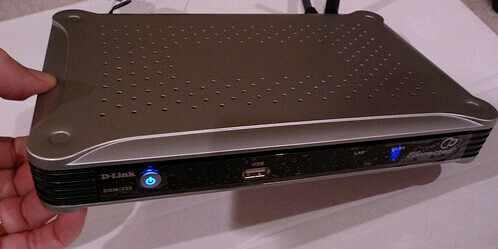 The device is supported by SageTV (with latest beta) and GB-PVR. Beyond TV is not yet supported, but you can get it working with some work. Another tidbit that might surprise some is the fact that you can have multiple HD-PVRs on one HTPC! This has been proven several times by SageTV users. The thing to remember here is that it is up to the software maker (SageTV in this case) to support multiple HD-PVR devices so this might not be the case for other HTPC software. There are more positives to report, but I’ll save that for the full review. These were all known going into this, but they are disadvantages of the HD-PVR. You still need a cable box or satellite box. You will need to deal with an IR blaster and the inherent delays in channel changes or figure out how to change channels with firewire. I’m currently using an IR Blaster, but will be going the firewire route for channel changes eventually. Currently no commercial detection available and not many apps let you easily cut h.264 files. Requires a pretty powerful processor and videocard or SageTV HDExtender to view these h.264 files. The current Hauppauge setup process can be easy if you don’t already own Hauppauge devices, but not always as easy as it should be. More on that in the review. Some of the New HD-PVRs are faulty – possible heat issues? This one fact has been a thorn in the side of several new HD-PVR owners. There are several of the new HD-PVR units that lock up and won’t record for more than a few minutes at a time. Most have attributed this to a heat issue, but Hauppauge is stating that they are unsure if it is a heat issue or simply an easy driver fix. Regardless of the cause, Hauppauge is RMAing several of the units and many of those who returned their faulty HD-PVRs already have a new one back that is working just fine. It’s never a good thing to have a bunch of bad units when you first come out with a new product, but Hauppauge seems to be working with those affected and handling the situation as best they can. If you’re experiencing this issue with your new HD-PVR, contact Hauppauge Technical Support where you will be advised on what the next step will be. 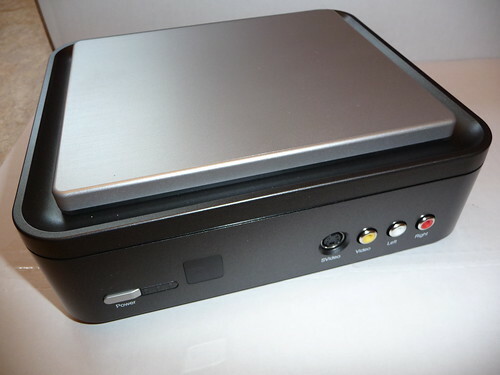 Bottom line, the HD-PVR’s are a very good device and despite the ones with heat issues I think once word gets around about what the HD-PVR can do for your HTPC, these things will sell like hotcakes (pardon the pun there.) Stay tuned to this blog for the complete review – subscribe to the RSS feed so you don’t miss any updates. UPDATE: AS OF FEBRUARY 2009, THE HD-PVR IS SUPPORTED BY THE MAC (with SageTV and Elegato), Linux and now even Microsoft Media Center! For those of you with Windows Vista Home Premium or Windows Vista Ultimate, Microsoft has released an update that includes several bug fixes and tweaks including a fix for the “broadcast flag issues” that prevented many VMC users from recording certain shows that had restriction flags on them. I use SageTV as my Home Theater PC software that runs all TV, DVR, Movie-Server, Music-Server and other media for my entire home. When I’m away from home I control SageTV using the excellent, user-developed SageTV Web Interface – a powerful web-based tool that allows access to SageTV across the web. But as I’ve begun to move my web browsing more-and-more to mobile devices such as my blackberry curve and my daughters iTouch, I’ve longed for a way to bring that excellent interface capability to my mobile devices. Now there is a way to do just that with the SageTV Mobile Web Interface. It’s being developed by Jason, a SageTV user. The mobile interface is currently in early alpha stage and not integrated completely with the SageTV Web Interface, but it’s current version is very functional and looks great on my blackberry. If you’re wanting to try it out and help test and provide feedback, you’re welcome to check it out in the SageTV Mobile Interface thread on the SageTV forums. Full instructions that I’m updating regularly can be found in this post. Below are a few sneak-preview screen-shots of the interface as it looks like on a standard mobile phone. Lots should change in the days and months to come, but currently what we have is an easy-to-read, integrated mobile interface where you can set up recordings, view the TV Guide (as customized for your HTPC at home) and view your upcoming recordings and favorites. Further integration of the Movies and Music functions found in the web interface – pushed to the mobile interface.